Like many of you in the industry, I am just returning from the US floor covering show, Surfaces. Surfaces followed Domotex, the European floor covering show earlier in January, which I attend every year. 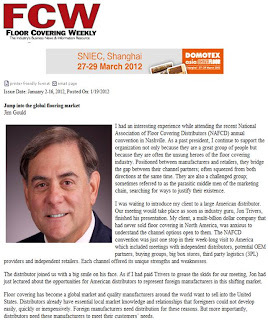 While sitting at the Vegas airport and thinking over these last two shows, I remembered the article I wrote recently that appeared in Floor Covering Weekly - Jump into the Global Flooring Market. Participating directly in the global market is a great way for distributors to differentiate themselves and justify their existence. Wholesalers who wait for a foreign manufacturer to walk into their office in America or who only attend domestic shows are only duplicating what retailers can do for themselves. Opportunity lies across the water. I have been finding and introducing new products into the US for decades, but I am only one man; there is so much out there for you to discover. I encourage you to take the leap. I'm headed to Domotex asia CHINAFLOOR in March and you should be too. It's the largest floor covering show in Asia. It's full of exciting products and manufacturers from around the world; not just Asia. My client, SuperClick, will be there again. They are a Belgian manufacturer of click LVT that got a big boost from Domotex asia and are now embarking on global distribution. Lumber Liquidators will exhibit there this year. I'm curious to see what that's all about. The National Wood Flooring Association will be there along with some of its members. I know of several US distributors going to Shanghai for the show this year, but many more of you should be going. I hope you will consider the possibilities. I wholeheartedly agree that we need to provide value to our customers. We looked beyond our border and now carry bamboo tile and flooring that appeals to the ever growing niche of green consumers. Great stuff. What's your take on floor mats? Any preference in manufacturing?